Giovanni Strazza's Veiled Virgin is located in the Presentation Convent, Cathedral Square, St. John's, NL. This statue was executed in flawless Carrera marble by the renowned Italian sculptor Giovanni Strazza (1818-1875) in Rome. Other examples of Strazza's work may be seen in the Vatican Museums and at the Archbishop's Palace in Milan. The St. John's Veiled Virgin was described by The Newfoundlander (4 December 1856) as the second such work by Strazza on the subject of a veiled woman. During the mid-19th century, Italian nationalism was on the rise, and there was a resurgence in nationalism in the Italian arts and music. 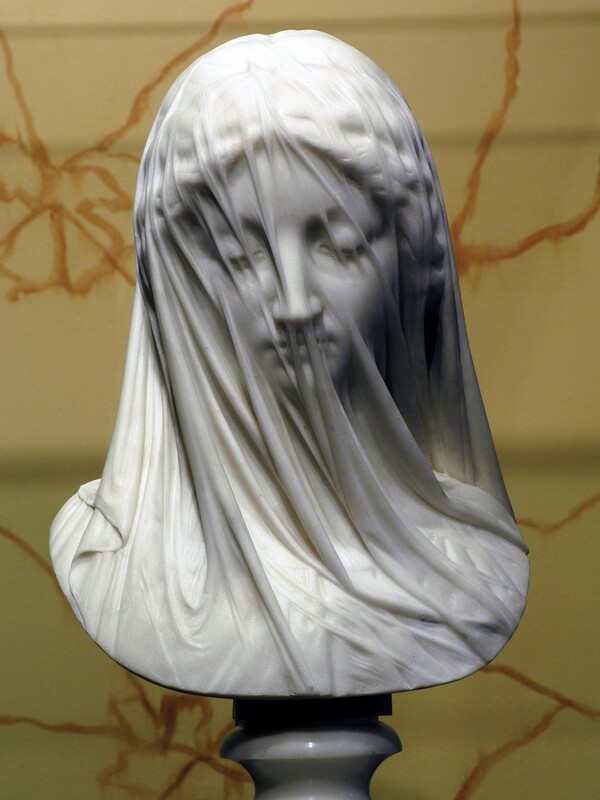 Strazza's Veiled Virgin is of a piece with this Risorgimento school of Italian nationalist art. The image of a veiled woman was a favourite subject of whole school of Strazza's fellow sculptors, with Pietro Rossi and Rafaello Monti the most important among them. Often, the image of the veiled woman was intended to embody Italia, in the same manner in which Britannia symbolized England, Hibernia symbolized Ireland, and Lady Liberty symbolized the United States. There are similar marble busts depicting veiled women in Canada, the United States, Ireland and England. None, however, are as meticulously crafted as the Newfoundland Veiled Virgin by Strazza: the facial features and the braids in the hair are clearly visible through the stone veil. On 4 December 1856 Bishop John Thomas Mullock recorded in his diary: “Received safely from Rome, a beautiful statue of the Blessed Virgin Mary in marble, by Strazza. The face is veiled, and the figure and features are all seen. It is a perfect gem of art.” The Veiled Virgin remained at the Episcopal Palace adjacent to the Roman Catholic Cathedral in St. John's until 1862, when the bishop presented the bust to the Superior of Presentation Convent, Mother Mary Magdalene O'Shaughnessy. Bishop Mullock's sister, Sister Mary di Pazzi Mullock, was a professed member of that community, and later its Superior. Strazza's sculpting confidently revives the ingenuity of the Baroque, and represents a technical triumph which surpasses that of any other work of art found in 19th century Newfoundland. The Veiled Virgin also testifies to the close linkages of the Irish Catholic community in St. John's with cultural and nationalist movements of the day in Europe. The Veiled Virgin remains in the care of the Presentation Sisters, Cathedral Square. It may be viewed by appointment.